I have the sense that you didn’t plan on being a divorced, single mom when you got married. You probably didn’t plan to raise your kids by yourself without a man until they became young adults either. I know that I didn’t. I never wanted to be a single mom never mind a divorced, single mom. But sometimes God laughs while we’re making plans and the struggles you’re facing as a divorced, single mom are real. They’re also exhausting and you’re often at your wit’s end. How you deal with some of the biggest struggles that come with being a divorced, single mom, will determine the quality of your experience and what you get to teach your kids. Being a divorced, single mom after a separation or a divorce is a wild ride! Buckle up… you’re going to be dealing with a lot of stuff. I don’t know of one single, divorced mom who doesn’t complain about parenting by herself. It’s difficult. You have a hard time finding time for yourself. (Unless you lock the bathroom door while you sit and read your IG account.) Your children may need more attention because of all the changes. Yet at the same time, they’re pushing your buttons and testing you. And the work, just to keep your home together (never mind clean or organized) never seems to end. Layer on top of that the stress of your separation and being a divorced, single mom is a lot of work. Most single moms need to work or to go back to work. They struggle to find affordable childcare. The hard part is managing the co-parenting schedule and disciplining your kids… being both the mother and the father. The struggle is keeping everything together and functioning. With nonstop pressure, it’s tough for most single moms to not end up on anti-depressants just to get through their days. So what’s a single mom, never mind a divorced, single mom to do? Pull up your big girl pants. That struggle is yours to tackle. No matter how many kids you have (News Flash: my mom had 6 kids when she got divorced… ) You get to figure out how to manage on your own for however many years you’ve got left. This is a big win for single moms after the fights, the arguments, and the disagreements with your children’s father. You’re the one who gets to recreate your family dynamics. The rules, the guidelines, the dinner menu, and the weekend plans are yours to create. You can’t stay in negativity and fear and be a good single parent. If you complain too loudly and commiserate with your friends you will stay in the overwhelm. When you yell at your ex or moan to teachers and the attorneys or your therapist you can create more trouble for yourself than you want. You don’t want to risk losing your children but more importantly, you’ll simply remain stuck in the overwhelm and fear. The two aren’t a great combination. As a single mom, you’ve got natural talents – a brain that is designed to multitask and a team at your fingertips. This is when single moms find out just how strong they really are. You get to teach your children how to help you manage your home. My mom needed our help with the cleaning. We may not have been perfect… when my 3 maiden aunts would visit unannounced, one or two of us were sent to meet them in the yard then show them a garden or two while the rest of us literally (I am not making this up) swept the dust and dirt under the rugs! It was all hands on deck! And we did it. Helping out at home is good for everyone. You may not feel as if you can handle being a divorced, single mom but you’re showing your kids how to be responsible. Since most children don’t like cleaning their own room never mind a house with their mom instead of playing outside, you’re giving your kids a chance to dream big. Sure, I also got divorced but my kids and are our own team. Together, we worked together to care for our things. We talk about the important stuff. And we also make our own rules (together) and when I have to, I say “No” and they know I mean it. They understand what it means to make something of themselves. Because together, we made a life independent of the family we all thought we had. When you’re a single mom who gets up and figures it out, you’re inspiring your children to go for what they want. I’m not saying there won’t be mistakes. But the mistakes will bring you closer together. You’ll create your own understandings. Whether you initiated the separation or not, you got out from a situation that wasn’t going to continue serving you. There’s a lot to be proud of! As a result, your children will feel that pride, even when they’re scared or confused. Will you be scared to become a divorced, single mom? Most definitely. Especially at first. Navigating that first year or two when you’d rather be with a man or out finding a husband, you’ll be steeped in fear and confusion. It’s not the time to share your deepest needs with your kids. It is, however, time to teach your kids how to respect and admire women. This is the time for you to get to know who they’re becoming. Instead of depending upon a guy to distract you from your anxiety. BTW: your children are completely aware of what’s going on. They may not be able to articulate everything they’re witnessing or be able to converse with you (and that’s not their role). But trust that they know. Your job is to parent them. Not to lean on them for your emotional needs. And definitely not to scare them with your unbridled fears. When they’re afraid, find a way to assure them you’ll figure it all out together. You cope with being a single mom by planning time to rest and to relax. The hardest thing about taking time for yourself is FOMO… the fear of missing out! 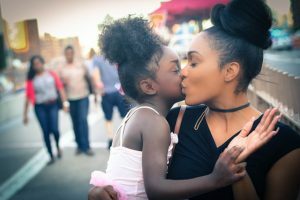 As a single mom, you may think if you step away from the pace of your divorce or the latest message tirade from your ex you’ll miss out on a big decision. If you avoid the school gossip or your kids’ sports program, you’ll be seen as a horrible mother or an anti-social, uncaring woman who doesn’t want her kids to get into a good college. Can we all just take a breath?! Most moms (never mind single or divorced moms) have a tough time taking care of themselves. But there’s so much at risk if you don’t! We now know how important sleep is for our health. You’re really going to need to relax. You need exercise and you need a good laugh. You may also need a good cry sometimes. On occasion, you simply need to turn off the fighting and watch the Hallmark Channel and let the fight go for a while. Trust that the fight will take as long as it does. During a separation or a divorce, one way to smile is to take a break and care for yourself. So please do so. Your kids want to see you smiling! Ask for some help super mom… enroll your kids in doing yoga or meditation with you. Try to get on bicycles together. Or visit a park and walk under the trees. Turn on the TV and watch a movie that’ll make you all laugh. You may experience some resistance to relaxing and caring for yourself. It’s pretty normal to resist taking care of yourself as a single mom. But it’s also crucial despite how scary or sad you may be. You’re going to want to manage the stress on your mind, body, and spirit in order to parent well. You don’t want to burn out because then it’ll affect your relationship with your kids. So take care of yourself!